A climate change science-tourism expedition got trapped when they set out to prove global warming is causing Antarctica's sea ice to melt, despite data showing the Antarctic 2013 year-average sea ice area is the highest ever recorded during the satellite era, which began in 1979. Friends of Science point out on their Polar Region Sea Ice web-page that Antarctic sea ice data shows it is 1.5 million sq. km larger than 30 year average and that there has been no global warming in 16 years. The data shows that Antarctica temperatures have declined slightly over the last 35 years, and that Antarctica sea ice area is now 1.5 million sq. km greater than the 30-year average. While seeking evidence of global warming in the coldest place on earth, a collection of climate change scientists and tourists have been rescued from their ice-bound ship trapped in record high sea-ice. 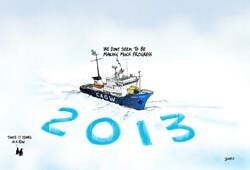 The Washington Post reported Sept. 23, 2013 that Antarctic ice had expanded for the second straight year. The expedition's rescue costs continue to add up as The Sydney Morning Herald reports Jan. 07, 2014 the US icebreaker Polar Star is going in to free the Russian research vessel and its intended rescuer, the Chinese icebreaker Xue Long - both stuck in the ice. The expedition leader Chris Turney, a professor of climate change at Australia’s University of New South Wales, told Fox News on Dec. 30, 2013 "We're stuck in our own experiment. Sea ice is disappearing due to climate change, but here ice is building up." The Russian ship MV Akademik Shokalskiy is categorized as an "A1 Super" with little ice breaking capacity according to The Sydney Morning Herald infographic. "The organizers sold berths to 26 inexperienced tourists and sailed into the world’s harshest environment," says Gregory. "Many ships have been crushed by Antarctic sea ice." Friends of Science have issued a public statement including southern and global sea ice anomaly graphs on their website. In an odd twist, scientific data and evidence provided by climate skeptic Anthony Watts, publisher of the climate change science blog “Watts Up With That?” aided in rescuing the tourists in search of global warming. According to a study released earlier this year by German scientist Hans von Storch et al (2013) "Can climate models explain global warming? ", global warming stopped in 1998. "This is ironic," said Gregory. He also noted that fossil fuels made both the mission and the rescue possible. “Public climate and energy policies should be based on scientific evidence, not models,” says Gregory, noting that reliance on theoretical climate models rather than actual data can cause costly problems. Rescue estimates stand at $400,000., and rising to be paid by Australian taxpayers. The Chinese icebreaker Xue Long that provided the helicopter to rescue the 52 passengers from the MV Akademik Shokalskiy subsequently itself became trapped in the sea ice. The passengers were transferred to an Australian icebreaker Aurora Australis. It is on its way back to an Antarctic base to complete a resupply mission before carrying the rescued passengers back to Australia. Friends of Science hold the position that the sun is the main driver of climate change, not human industrial activity or carbon dioxide. Therefore carbon taxes and ‘climate change’ targets are an unnecessary burden to taxpayers and the economy.